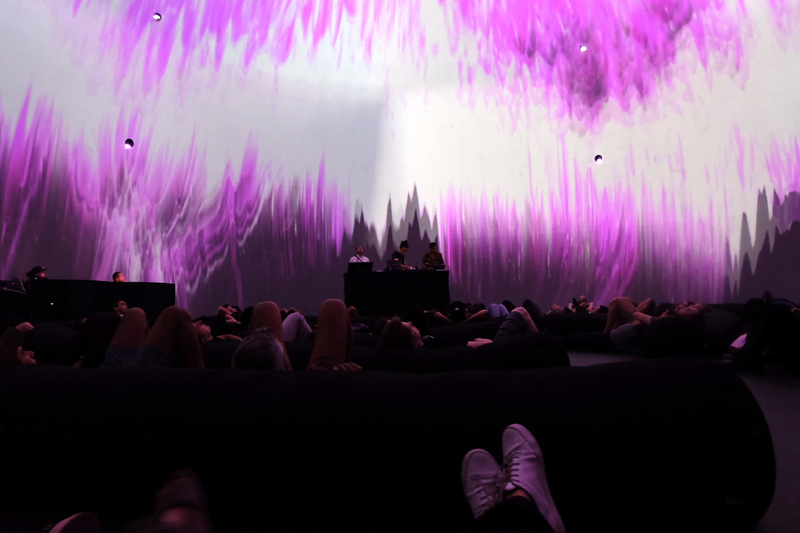 Revive is an live audio-visual performance project that brings together a musical artificial intelligence architecture, human electronic musicians, and audio-reactive visual agents in a complex multimedia environment of a dome view with multichannel 3D audio. The context of the project is live audio-visual performance of experimental electronic music through structured improvisation. Revive applies structured improvisation using cues and automatized parameter changes within these cues. Performers have different roles within the musical structures initiated by the cues. These roles change as the performance temporally evolves. Sonic actions of performers are further emphasized by audio- reactive visual agents. The behaviours and contents of sonic and visual agents change as the performance unfolds. REVIVE explores the affordances of live interaction between the artificial musical agent MASOM, human electronic musicians, and visual generation agents. MASOM is a musical agent, an artificial intelligence(AI) architecture for live performance. A sub-field of MuMe, musical agents are artificial agents that automatize musical creative tasks. Together, the three sonic performers and three visual agents produce a live performance of experimental electronic music, electroacoustic music, musique concrète, soundscape, noise, and IDM through structured improvisation.